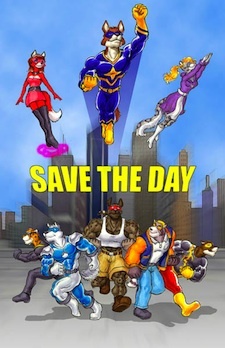 Save the Day by D.J. Fahl is a 2010 novel published by FurPlanet; it's both a gay-coming-out story and a superhero drama. It's a decent read, although there's room for improvement. The novel is set in contemporary America (Portland, mainly), except superheroes are a new phenomenon that have only appeared in the last 15 years or so. There are maybe a couple dozen people with extraordinary powers and advanced technology around the world, and the world is still learning to deal with them, from the social to the political to the legal side of things – like launching a class-action suit against the estate of a supervillain for damages.